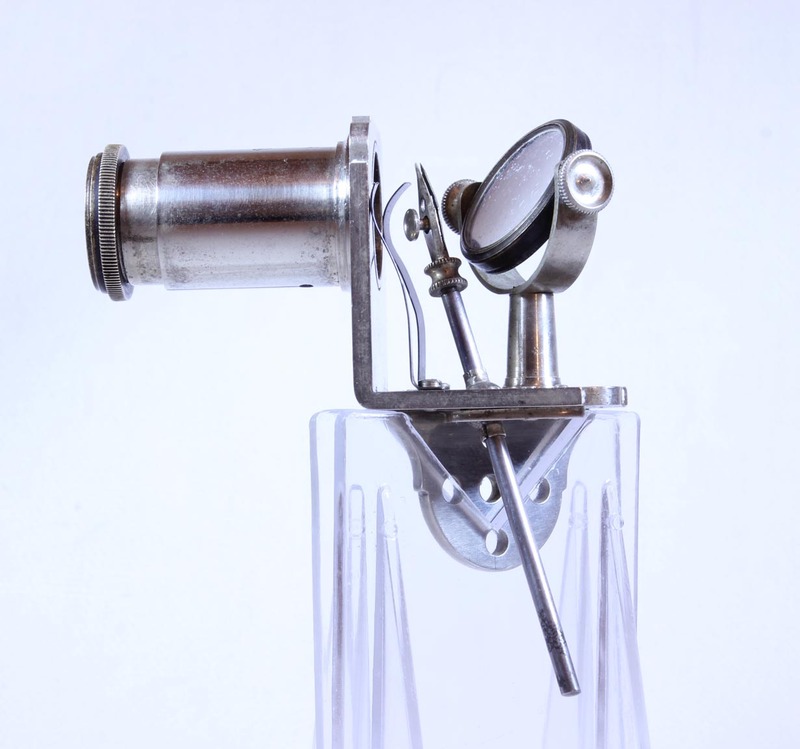 This tiny microscope is made of Nickel-Silver or 'German Silver,' an alloy made of brass and nickel (about 60% copper, 20% zinc, 20% nickel; brass is made of only the first two in varying proportions). It was not a cheap alloy at the time this instrument was made. The instrument is quite small measuring only about two inches long in greatest dimension. It measures about 1 7/8 inches from the bottom of the handle to the top. 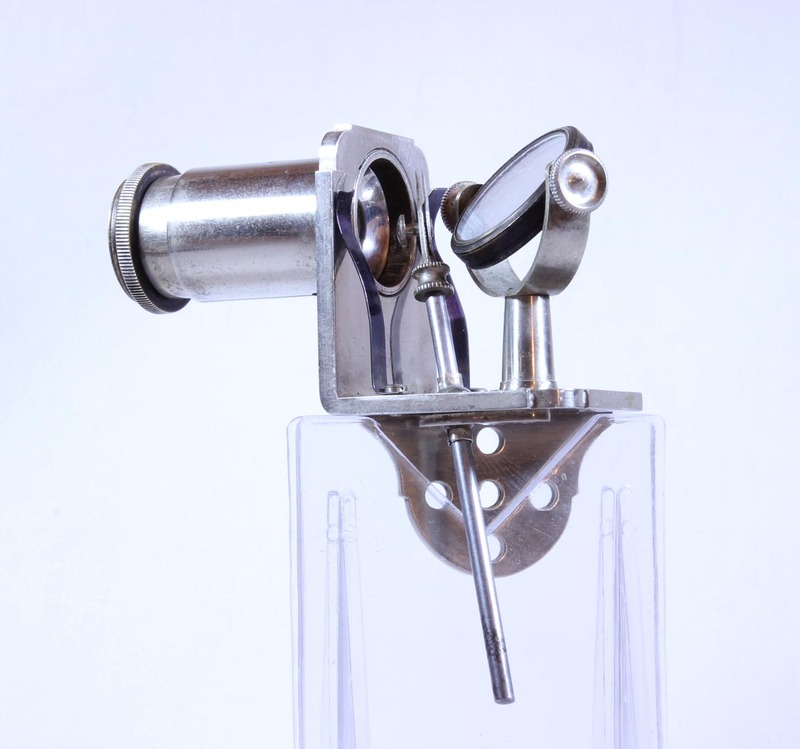 It has a stage forceps which fits into a ball joint. There are two stage clips made of spring steel, one of which has a piece of the end missing. 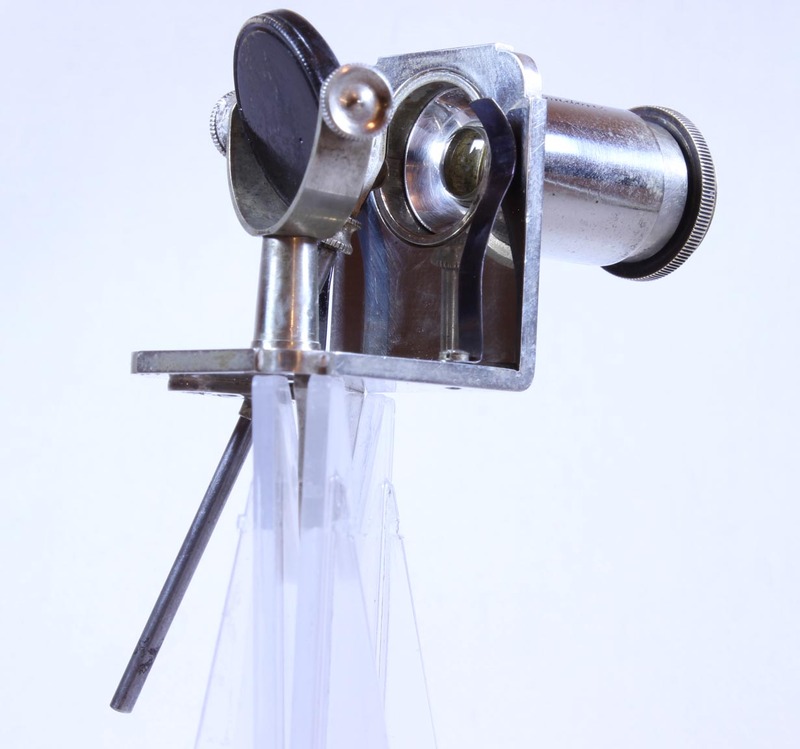 The L-shaped main support bracket supports not only the forceps holder, but also the fully gimballed plano mirror. The optics consist of a compound lens system which includes one lens at the top (eye) end with convex surface toward the eye, and another lens or lens group at the other end, convex side toward the object. It has a tiny lieberkuhn which screws on the object lens; it can be screwed on backwards when not in use for storage. 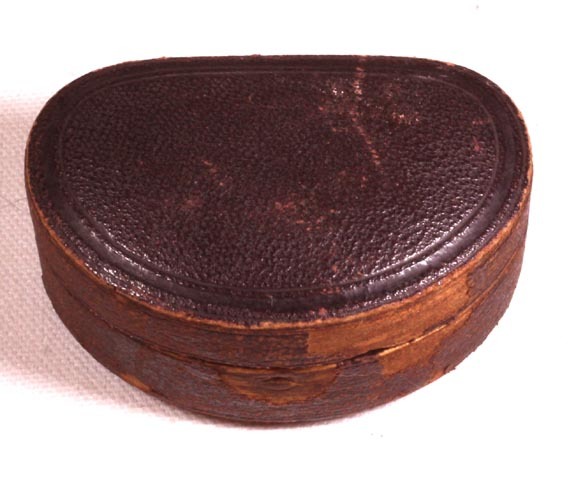 The instrument fits in the D-shaped Morrocan Leather covered case, with the interior bottom lined with blue velour and the top with purple silk with a gold signature of 'John Browning, 63 Strand, London.' The instrument itself has the same signature including the address. John Browning was a famous optical instrument maker, best known for spectroscopes of all forms, including those for the microscope ('microspectroscope') and telescope; he made other optical devices including microscope objectives. Examples of an objective, microspectroscope, and telescope spectroscope eyepiece, are all parts of this collection as is a copy of his book 'How to Work with the Spectroscope'. His books on the spectroscope are classics. He operated at the address noted on this instrument from 1872 to 1900. 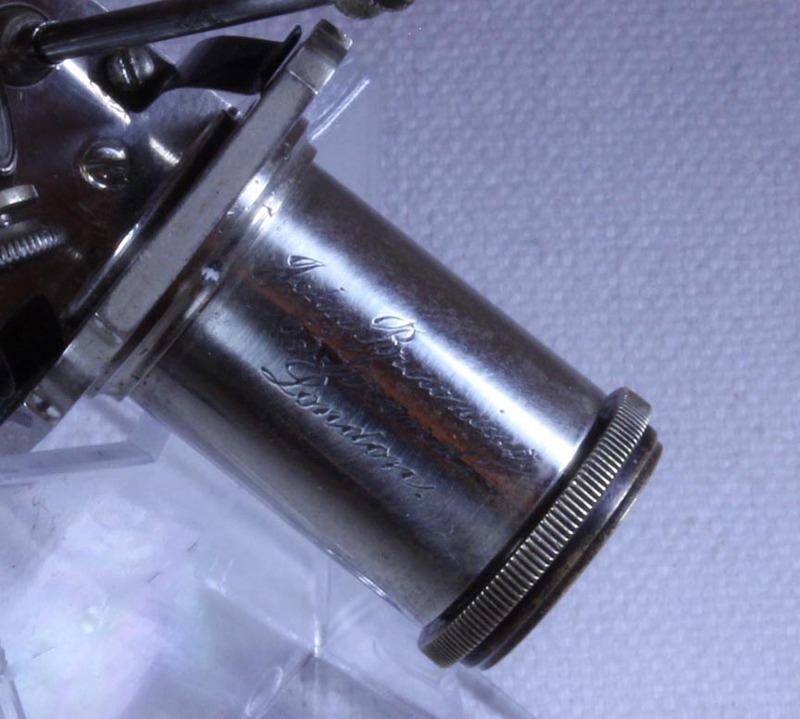 It is remarkable that the price of this microscope, was £3 17s 6d; this would be about £344 or $578 today. 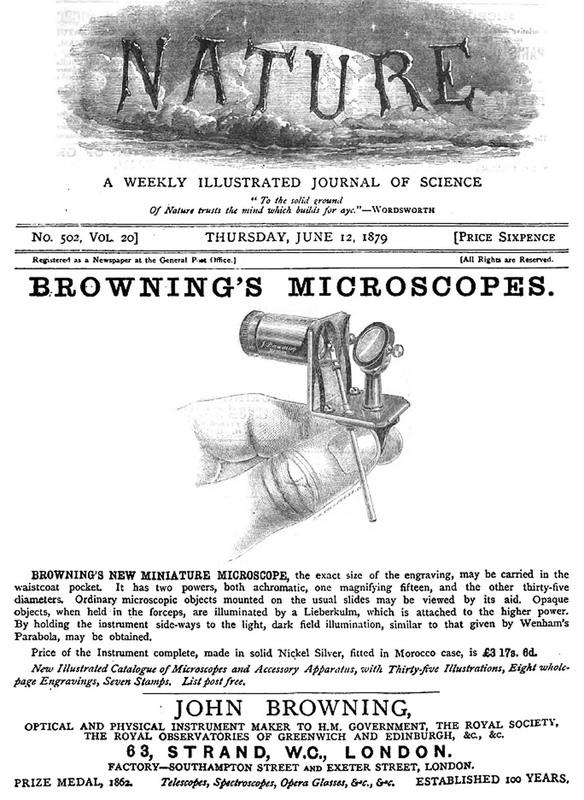 This compares to the price for the Browning Portable microscope at £140 today, or about $235 in U.S. currency. This makes the 'Mini' quite pricey. Its price and the difficulty of using such an instrument (especially if you have big hands like mine! ), may explain why the 'Mini' is so rare today-it was never a cheap item, was difficult to use, and was grossly inferior in use to the (much cheaper) Browning Portable; likely not many were sold. In the same era, another small instrument, the 'Pillischer Lenticular' microscope was much easier to use than the 'mini' albeit a bit larger. But any handheld microscope is grossly inferior to any microscope that can be set up on a table-even Brownings little Portable microscope. 1. Advertisement in: Nature, A Weekly Illustrated Journal of Science, no 502, Vol 20 (ad shown above). 2. 'Miniature Microscope' JRMS 1878 p 296. 3. 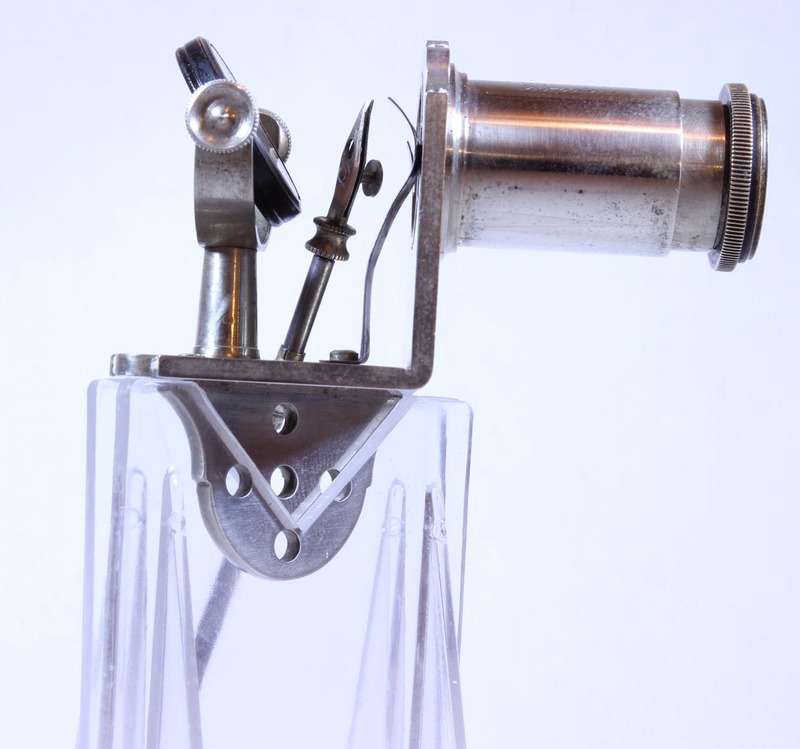 Two other examples of this microscope are reported, one in the Collection of the Science Museum Inv #1921-753(London), and another shown in Giordano's 'Singular Beauty' catalog of Simple Microscopes. 4. 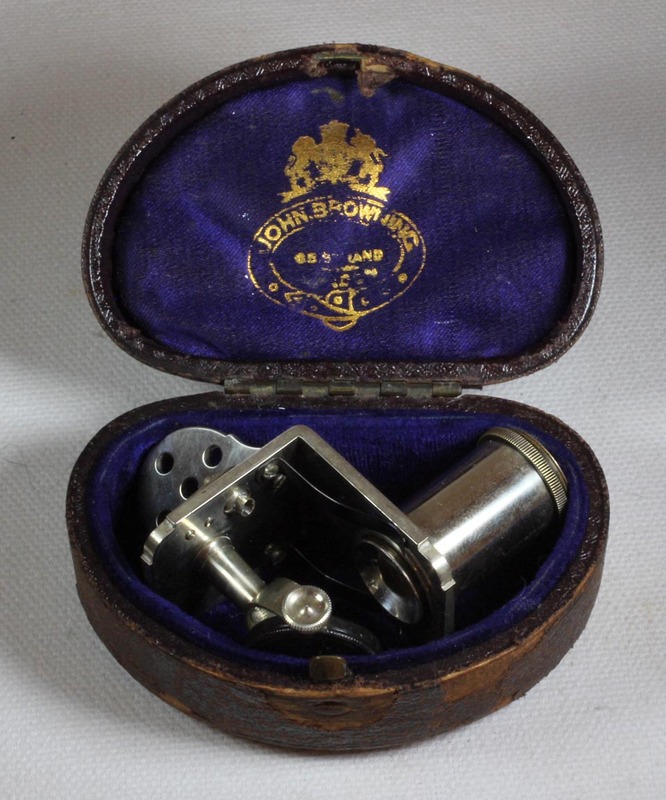 Talbot, Stuart on Browning's Miniature Microscope. Bulletin of the Scientific Instrument Society, No 69, June 2001.